I wanted to write this end/new year note since last November. Even as the new year had passed and now is not end year anymore, the note still has not completed. Let me write it now. As always, end of year to new year is a good place to make evaluation for the past time and planning for the future. Thankfully I and wifey was born at the end of year. We got married also in December. Then making a resolution at this time will be very logical step. Even with slight late execution should be forgivable, late is better than never, isn't it? Different with my notes from previous year, I would like to elaborate this year note by describing what have done well, what could be improved and what the next plan. For whom join toastmaster, usually speech evaluator will said those words, "what have done well" and "what could be improve". Following are notes from my previous years. Actually I can feel quite proud by always having some kind of resolution note every year for the past 5 years. Most of the time everything are awesome. But still as human being, there were some friction happening sometime. But I have to admit that most of small problem is caused by myself. I don’t know why, somehow I realise that I have a bad temperament that can be easily triggered for even a nonsense things. In this regard I have to appreciate a lot my wife whose always be patient in facing her sometime-childish-husband. I join Redmart last year. The first time I work with many awesome people. The work are fantastic and challenging. I learn a lot even in quite short time compare to previous time. I and my wife went to Australia last November to do trip style we had not done before. We hire a campervan. To whom not familiar with campervan, it as big car, with most household facility such as bathroom, toilet, kitchen with gas stove and sink, a lot of cabinets and flat bed for sleeping included. We drove from Sydney to Melbourne and return to Sydney again with total distance more than 3000 km. We camped in many places and stop by in many cities. I would like to write the trip detail in other post, but in summary, that trip is really awesome. When reflecting the goals from my previous year resolutions note, I have to admit that most are too vague. So the major improvement that I have to do on this year is to make more measurable and reasonable goal. Actually there are some entries that is not shown above because it is more personal. I and my wife have a trello boards that contain cards with detail step plan to achieve those goals. Happy belated new year. There is never too late to setup goals. As long as we would like to accomplish it. So it is started when I and my wife were boring on last Saturday morning. Initially we didn't have any plan yet. Suddenly my wife was suggesting why don't we try Smove and just drive around Singapore? I rarely writing review about startup services. But since Smove is quite innovative, I think write a short review will helpful for whom who would like to try the service but want to know some experience from another customer that have tried it. 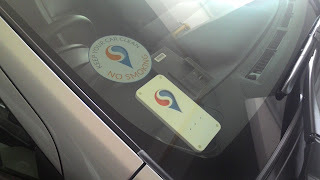 Smove is identifying them-self as Car Sharing platform instead of just car rental. I am trying to understand that the main focus of car sharing is on short term usage with car can be picked up in several pickup point collection and returned to any other drop off collection. So the car is shared by some users. While the focus of conventional car rental period is renting car at least a day or could be monthly or even yearly. I signed up with Smove last week. The main trigger because I think their marketing team successfully hook me with the ads that they put on Facebook. Another trigger point is since Smove based at same building with my current office so that I encounter their brand quite often. Like when seeing some of their staff wearing the company t shirt and several of their electric car that is parked in parking lot. The process of signed up is straight forward. After giving some personal data like name and address, we also have send our driving license scan to their email address and submitting our Ezlink card number. User is expected to have minimum 2 years driving experience to use their service. Maybe they need this for insurance purpose. Since I only converted my Singapore driving license last year, the Smove staff replied me an email asking another proof. I then sent my Indonesian driving license that has been issued for some years and immediately after that my account is activated by them. Earlier, I mentioned that we need to submit our Ezlink card number. The reason is, Smove try to make car pickup up and drop off as convenience as possible with key-less entry system. So that we don't need to collect the car key when need to use the car. This can be happen by utilizing Ezlink card to unlock and lock the car. This is a feature that I would say really innovative. Moving forward after signing up, on last Saturday we decide to try the Smove service. After my account is activated we can start to book the car. The step is just logon to their website and go to new booking menu. First we have to select booking start time and booking end time. Later they will have the list of pickup points. As the time I write this post, there are about 26 pickup locations that have between 1 to 3 cars per location or zero car if full book. After selecting a pickup location then we can select where we will drop off the car at the end. Then we will got confirmation email and our booking process is done. 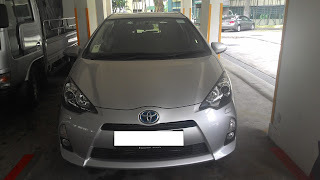 I booked a car in pickup location near to Farrer Road MRT. 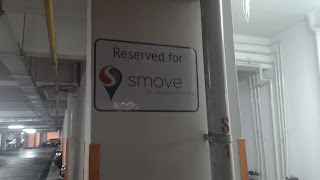 15 minutes before our booking time, Smove will send us the car plate number and the exact parking slot location of the car. From that information we can find the car. There are nobody waiting us in the car park. We just need to tap our Ezlink card to the reader in front window near driver seat and the car is unlocked. Then we get in to the car, put the ez link card inside cash card machine for paying parking and ERP charge. Car can be started by pressing to power button and all is set. I haven't talk about the car yet. Smove using Toyota Prius C for all of their fleets. I would say Prius is quite premium car. I believe the reason why Smove is using this car is because since Prius is hybrid car then the gasoline consumption rate is freakingly low. Fuel rate will be important because the service fee is including fuel. Smove pay the fuel for us. Since It was the first time I drive Prius, I would say it was a pleasant experience. The car transmission is automatic like most car in Singapore and I also don't think there are manual transmission type of Prius. The car is five seater so that if you need to bring more people, then Smove is not an option for now. The car have built in GPS so that we don't need to bring one. We rent the car from 1pm to 11pm that day. The biggest agenda was we went to Ikea in Tampines since for sometime my wife keep asking to buy a dining table set. Since we have car that day it will be easier to bring the item without need to hire a van. The dining table dimension is 125 times 75 cm. We also bought 4 set of chairs for the table. All of them perfectly fit inside the car, of course after folding second row seat. After that we planned to visit east coast park but fail to do so, since it was really crowded and we don't get a spot to park the car. Then we decide just to visit a friend place. As night came we drive home to drop off our Ikea's stuff. Then we drive back the car to our drop off location. After park the car and lock it the next step to do is to send SMS to Smove citing our return location. That SMS will be use as acknowledgment that we have returned the car and Smove should stop charging us for the car usage. Overall I would say that it was really a pleasant experience. The only caveat is as of now, all of their pickup location is in southern area. At the time Smove have more coverage then the convenience of car sharing concept only can kick in. The main point of car sharing is when user can pickup and drop off the car conveniently. The most important aspect of pickup location is the one near to home. If picking up the car will need one hour traveling and another one hour after returning the car then it will too much inconvenient. The second thing, it will great if the rental cost could be reduced little bit. I am not saying the cost is expensive. It is generally about the same rate like most rental company in Singapore. Moreover Smove taking care car refueling. Even Smove offer the possibility to use the car in really short start from 15 minutes only which is not possible in conservative rental service. But lower price should attract more customer. With the current price I don't think will use Smove quite often because actually the need of car in Singapore is not so that paramount since it has excellent public transport system. In conclusion, I really enjoyed the experience and will recommend for anybody to try the service. I will appreciate if you can use this link if decide to sign up. November and December are special months when many special occasions held. I got married on November. My wife birthday, my most special person, is also in November. And December is my birth month. Yesterday was time when my age clock tick to another year and it remind me that I have stayed in this earth for another extra year. This year is my last twenties and next year my age second will be incremented too, that make me join thirties group. Before get too old and too lazy, like usual, this event is always a best time to do some reflections and evaluations. I want to move back a while with my imaginary time travel machine. I often feel that time flies. Sometime I still remember several old fragments, when first time I have memory that I can recall from my childhood. One of that I still can retain is, when one day I was play outside near my home. Then my dad fetched me to go home. I was around 4 years because I remember that my mom was expecting her second child, my first younger sister. I couldn't recall any memory older before that time. We moved to different city shortly after my mom delivering my first younger sister. I was entering primary school when I was around 5 years old. I couldn't remember most part of those times. Like I don't remember any name of my friends. I only can recall some of memory snapshots. I was schooled there only for one year because then we moved back again to another city again. On second year of primary school I was staying with my uncle. I was with his family for 3 years from 2nd grade until 4th grade. I couldn't remember much thing around that time. However my memory was better because at least I can remember several of my friend name. Even I can found out them again in Facebook, some years later. On 5th grade I return to stay with my own family. Then 2 years later, I entered junior high school. I can recall more and more. Sometime I wonder about how magical human memory is. It getting better and better when age increase and one time will decay again when we reach older time. 3 years in junior high school with important achievement of getting to know how to fall in love with girl, then I entered high school. Fast forward 3 years I entered university. More freedom, found more diverse people. Four and half years in university is like a blink, then I graduated. Got a job luckily 3 months only after graduation day. Somehow destiny guided me suddenly to work as a programmer. I work in Jakarta for 3 and half years then destiny flew me to nearby country and has worked here in Singapore for another 3 years. So what I have achieved? Anything I can proud of? Nope, I haven't help to resolve world hunger issue yet nor in near future could have capacity to win a noble prize. I am not so that impactful yet as an individual, although hope to be so sometime later. More or less I feel that I still about same with 4 years old of me. Except that I little bit taller and much more fatty. However, inside I still have the same soul with that little boy and hoping could be a better and better person as the time moving forward. Getting older is a gift that not all people can attain. People life and dies every time. Be grateful if we still breath at this exact second, which mean we still have chance to make world a better place, said no startup founder ever in their pitch. I am serious in this point, as I believe there is no impossible thing to achieve and any damage that couldn't be recovered in this world as long as we still live and have strong commitment to do so. Making world as a better place could be started just to make our self a better person. Hence I still disappointed to myself is I feel that I still haven't make any significant movement to make myself as a better person yet. I always state my personal motto as "Life is to precious if just to be ordinary". Hence I feel that most of the time I still too much ordinary. No sin to be ordinary but most magnificent achievement in this world is done by extra ordinary person. To have just a standard life maybe we could just be ordinary. However to have a good life, a proper house, a nice vehicle, frequent travel to beautiful destination to enrich our soul, to have best health and education for our family then we have to be extra ordinary. Best result comes from best effort. And I feel that I haven't presented best effort in my life yet. This is important thing that I remind in this event and I have to serious to start doing best for everything I do from now on. Let see following example: doing best job in my work, be a best husband for my wife, be a best father for my future children, be a best son for my parents, write a best software., write a best book, use every day time as its best, and so on. Hoping that by executing those best input to get best output. Let we say that best output as a thing called success. Everybody want to succeed, aren't they? It started by knowing and define exactly what we want. Prescribe the step to get what we want and break down it as specific as we could. While have not succeed, do every step that will help we getting closer to what we want. It might be funny, but sometime people don't know what they want, which indicating that most people satisfy to be just ordinary. Some people know what they want, but they don't have exact step to get what they want. Whom that even not doing number 1 has messed up them self . Whom that execute only step 1 to 2 is a dreamer. Whom that execute all of those three will only be the person that could succeed. Ironically I rarely doing 3. Sometime I do step 1, sometime I do step 1 and 2. Less often do the whole steps 1,2 and 3. This have to be changed. This is standard bucket list that I often wrote. Hoping this year can put more full commitment to achieve these. This morning my wife re-shared my Facebook status from few month back, that even I forgot from where I have it. But understand this steps will help a lot to achieve our "what we want list"
Be grateful to the 3 You's - The Past You, The Present You, and the Future You. Exercise - when you exercise, you are doing your future self a huge favor. Read Daily - almost everything we've ever thought of, or gone through, or wanted, or wanted to know how to do or whatever has been already figured out by someone else. Reading will help you better understand. Have faith and follow through with action. Special thanks to my wife that like always never stop giving me sweet surprise including giving some of my dream lego set in my birthday. Luckily some of my friends also came and spent an awesome night to talk about life. If we drive our car every day, could we become a better driver? Not necessary. Daily driver of course will be good in driving compared to the new learner. He can act and respond promptly for some sudden event on the road. However, it will not make he can do more than mundane driver task as he do daily. There will be no way such ordinary driver could race in circuit just out of sudden. Racer is also a driver but not vice versa. Racer need enormous training to gain his expertise. Today I am thinking about how we always have to improve our competitive advantage in this life so that we could be more than just "ordinary driver". After all, basically life is about competition, isn't it? Competition itself that bring our world as now. The good example of competition bring is advancement technology around us. There will be no major invention, airplane, transistor, computer or sophisticated gadget without driven by competition. At other side political competition by using unfair way is the negative example. In this note, I would like to elaborate my own view of how to be stay on the edge. The first step is to go outside our mundane life. I realized that sometime human trapped in a comfort zone when everything is just feel fit perfectly and the routine is just nice. However the comfort zone bring the stagnancy that will make we less competitive. When we arrived in such situation we should push the throttle hard so that wouldn't stuck too long. The example of pushing the throttle act are as follow. Read a good book. With all of sophisticated invention in modern life, still book is one of most effective way to transfer information and knowledge that can stand against time and place. Book will bring a new information that we can learn and also good story that can inspire. Sometime I read a few books in one month but another time I even don't read any book in several months. As a rule of thumb, at least read one book every month should give us a great advantage in long run and will keep us ahead most of people. Second important way of how to keep competitive is by make friend and meet awesome people. There will no more factual inspiration rather than actual story from the person itself. People can give inspiration and share useful experience. Which at the end could make us feel "envy" and motivate us to do better in life. Making friend with such good people also will bring so much benefit. Old idiom said bird of same feathers flock together. Making friend with awesome people definitely will help us to learn and adapt to be such awesome as them. The next important step that we need to do is patiently doing something to make us always on top. One day we might find an insight to improve our life by doing this or that. However, most of time motivation is fluctuate and easy to go up and down. One of the factor when sometime motivation is going down when we chase something is impatient. It is a nature that human often want instant result. As an example, we cannot be rich just in short time except winning a lottery which is usually will not give long lasting result. Chasing a wealth need a hard effort and sometime a long process. We need to earn coin by coin, sometime push our self from wasting money unnecessary by not buying something that we don't need although we might want it so hard. Another example is the effort of mastering something. There is no shortcut. There is maybe a crash course that will give us general knowledge about something that we would like to learn. But still mastering skill and knowledge will need long time and much patient. Malcolm Gladwell discussing this in his famous 10.000 hours rule. He said that the key to success in any field is, to a large extent, a matter of practicing a specific task for a total of around 10,000 hours. Patient hold major role here. Without patient we can easily lost motivation. Patient is a virtue and impatient is a vice. At the end this note is a reminder for myself so that I will be alarmed to do continuously improvement in daily life. Stylus in smartphone is something that actually I rarely use but I can't live without. It was started almost 3 years ago when the first generation of Samsung Galaxy Note released. The main identity of this smartphone is the stylus as the Note name coming from. Other than that, this was one of early Android smartphone that offer very big screen. Galaxy Note was predicted to be fail in market. However it became very successful. Samsung even use that success by producing Samsung Galaxy Note II and the latest one Samsung Galaxy Note 3. Honestly, I was not thinking to purchase another smartphone while my Galaxy Note 1 is still usable. Indeed, there are some scratches around the handset and the hardware little bit behind recent application demand. Anyway, I was still enjoying the handset and not to attracted to take another one. Until one day when I open Singtel website and they announced some discount for device recontract. I supposed to pay $258 initial payment for recontract to Samsung Galaxy 3. But during that promotion, I only need to pay $158. Considering that with or without new device I still need to pay monthly subscription around $70, I am thinking recontracting will be better option. So I eat my own word by taking this new handset. Here are some of opinion after about two weeks I am using the handset. First, the hourse power is excellent. I has quad core processor, 3GB RAM and 32GB internal storage. Second, this the latest android smartphone that include stylus for whom that consider stylus is important such as myself. Third, the screen is quite large but still manageable. Fourth, the battery life is satisfactory. Five, several interesting accessory available. The notable one is Samsung Gear even though I don't have any interest yet to buy one. Beside that I am S View smart cover. With S View cover we can receive call and playing mp3 without opening the cover. Not so that important but the technology have their own use. Six, the phone faster data transfer by USB 3.0 cable although the transfer speed might be limited by storage speed. I respect backward compatibility of USB 2.0 by having new port but still accept old USB 2.0 connector. Overall, I quite enjoy this new handset. Let see what advancement in technology that will happen in upcoming two years after this device contract ended. Wow it has been six month again after my last post. And I will just jot down again some personal note this time. I went to Europe from January until March earlier this year. I took a long leave from my job. I was visiting my wife in Germany, the place where she was taking master degree. On end of January, my wife defending her thesis gracefully. The day after we went for awesome whole month euro trip until early March. We visited 12 countries and 15 cities. It was a great journey, hopefully I could share it in another post. On end of March we returned to my wife town. It is Ilmenau, very beautiful city in East Germany. We spent the rest of the month enjoying free time. On weekend sometime we went for some short getaway to nearby city. Other time we just invited or friends near by. In the morning sometime I did jogging. In the afternoon, we went to swim. Until we finally realize that end of March has come. We need to go back to Asia. We flew back to Asia on last day of March with short 24 hours stop by in Dubai. We drove around for few hours in very hot Dubai. At the end we landed in Jakarta. Going back to the real life. In Indonesia, we visit both of our parents. Within one week I left my wife in her parent place while I going back to Singapore again to resume my job. Immediately after arrived in Singapore my main important task was to find apartment. It was not so easy task but luckily everything go so well. Now we are staying in cozy apartment in Northen part of Singapore. For the first time we feel complete as a married couple. After two years earlier spending life in a long distance relationship. Now several we have several todos in this life. The first thing first to have baby very soon. Then hoping find more challenging job for both of us. Saving more money, especially to buy a house and a car. Find a scholarship for post graduate study. Find and execute business idea. Write books. And having happily ever after life. Birthday is a special reminder. It will make us recall that few years back we had born to this world and one day we also need to depart. We do not live forever. There are two important things we could do for this special occasion. First, to do self reflection and second, to pray for our wish and dream. No wonder that most common birthday greeting is "wish you all the best". Start from reflection, I still not satisfy with myself. I still quite often wasting time instead of doing something useful. I still procrastinate too much. Time management is still the most important skill that I have to improve. Regarding wish and dream, like usual I have so many those things in my head and heart. Likely I am blessed to be a super dreamer person. However I won't blabbing it here at the moment. I just would like to restate a personal note that I had written last year. In this age increment, I want "To be more grateful and more humble". There are to many things that need to thank for, like for example this simple but so touching present from my wife. Red tiny MP3 player with my name on it. Maybe wifey have realized how much I addicted to trance music although she said that she prefer me to listen Quran recitation :). Nonetheless, there is on important wish that likely could be worth to be elaborate. I want to be a person that can give positive impact in social contribution. I have one friend. He is few years younger than me. Yet, I see he has done so many positive contribution in social life surround him. He often arranges and involves in many social activities. Like teaching children from street, arrange blood donation event, collect donation for neglected old person and event recently he managed to arrange some support to develop Islamic school for elementary student. He made me feel so ashamed. In this 28 years of life, I never had done things like he did. Relate to previous paragraph, since I was studying in high school I always want to be a teacher. Might be not a school teacher but more to be a lecturer or just general speaker. I love to share the things that I know. I have one dream to be a great and inspiring speaker. Maybe one day I could speak in one of TEDex event or some software development conference. Teaching is not only the matter of transferring knowledge but also transferring passion. That's why teacher must be an inspiring person. I am hoping I can make this dream come true. This year is my third year pursuing some scholarship for master study. I have received countless rejection letter. I am hoping can start to study again soon. After that then maybe I could start teaching, inspiring and give positive social impact to my surrounding. For now, let I start by giving this very small contribution by pouring idea through simple writing and push myself to learn how to speak and share better by preparing my next project toastmaster speech for next week. Life is too precious if just to be ordinary. Let's live life at the fullest.